Our day services are for people who are approaching the end of their life and/or have complex palliative care needs and is provided week days, from 10am until 3pm, in Weymouth, Dorchester, Bridport, Blandford and Sherborne. At these sessions, patients are offered lots of stimulating activities, including art therapy, complementary therapies, word games and more. Brenda Webster is from Pimperne and attends Weldmar’s Wednesday sessions in Blandford. She added “Sometimes we do talk about our problems – it helps a lot. We don’t always want to offload on our nearest and dearest because it upsets them. But you can always get the lovely people at Weldmar to help you out”. 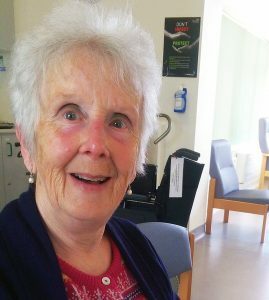 Maureen Streeter is from Child Okeford, has motor neurone disease (MND), for which Weldmar is a centre of excellence. 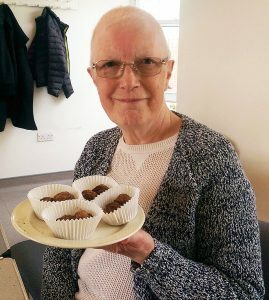 She also attends Weldmar’s Blandford day services, giving her husband a few hours of respite, while she enjoys herself taking part in activities and talking to people without feeling self-conscious. “Everyone is lovely here,” she said. “I’ve been coming for four-and-a-half years and I don’t know where the time has gone. Weldmar do a lot for MND patients. Every few months I go and see Dr Karen Steadman in Dorchester or she comes here. They offer a lot of palliative care. I love it here – it gives me confidence. I have an iPad and can communicate with that, but here I feel I can talk – anywhere else I feel self-conscious if I don’t know people”. Weldmar’s day services are available to patients with cancer and other progressive conditions, such as motor neurone disease, who require specialist help. To access Weldmar’s day services, a healthcare professional will need to make a referral on your behalf. This could be your GP or your specialist nurse.